• Tacks and hammers: Upholsterers used tacks and hammers in the 19th century. While their method is slow and outdated, Jeanne notes that it’s a good way to learn. • Staple gun: “It will bring a lot more joy to the project, as your work will be more efficient and clean,” Jeanne says. • Staple remover: “You’ll need one to get old staples and tacks out of a chair,” Jeanne says. • Wooden mallet: While it will work better than a rubber mallet, remember that it will also be heavier. 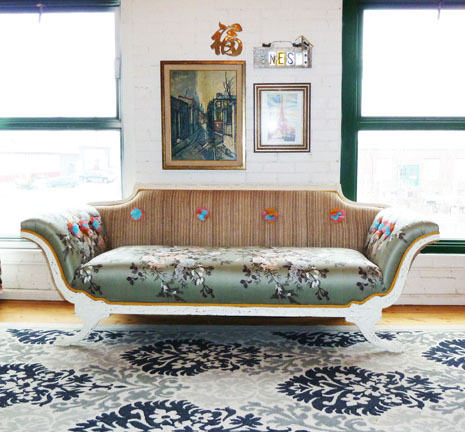 “It would be a sin to repaint a vintage piece in pristine condition,” Jeanne says, but this sofa (shown above) was far from pristine. Jeanne repainted it white to “bring it back to life.” Then, she reupholstered the sofa’s seat with a vintage floral fabric and its back with textured striped linen, creating a “faux tuft with floral buttons” on the sofa’s back and inside arms. 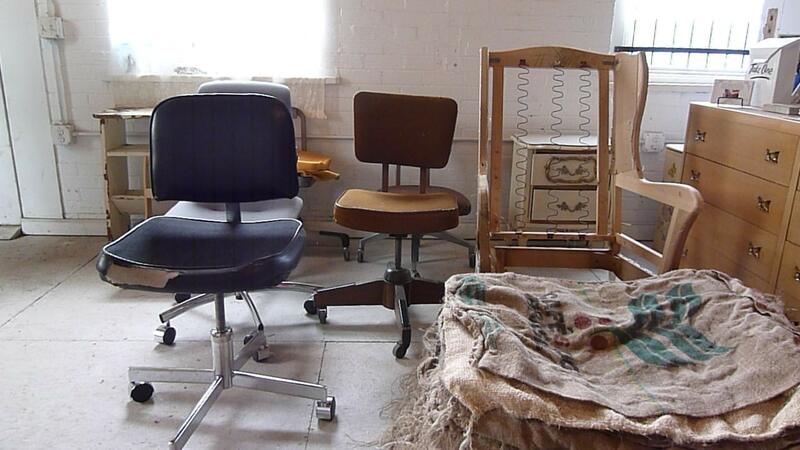 When a bank was trying to get rid of its beat-up office chairs (shown below), Jeanne happened to stumble by and took the whole lot. 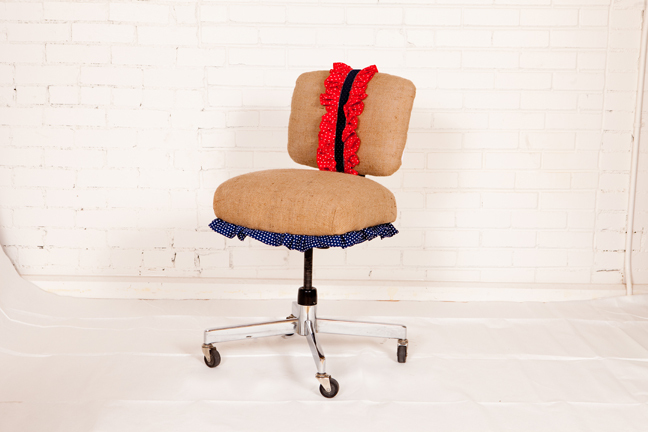 Jeanne redesigned the office chairs, creating a stunning set of chairs (shown below). 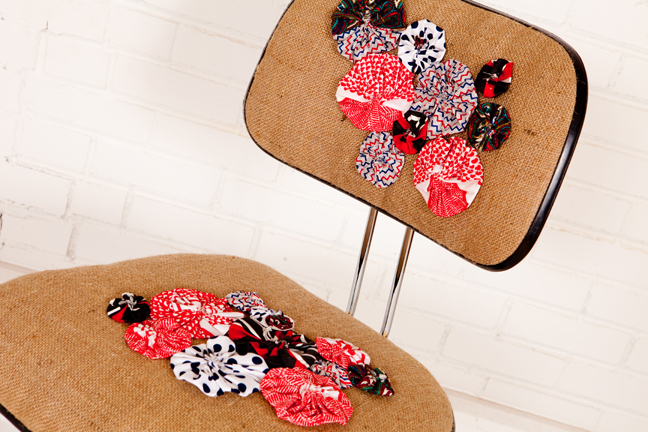 “I love combining their industrial feel with colorful vintage fabrics,” she says. Want a step-by-step reupholstering tutorial? 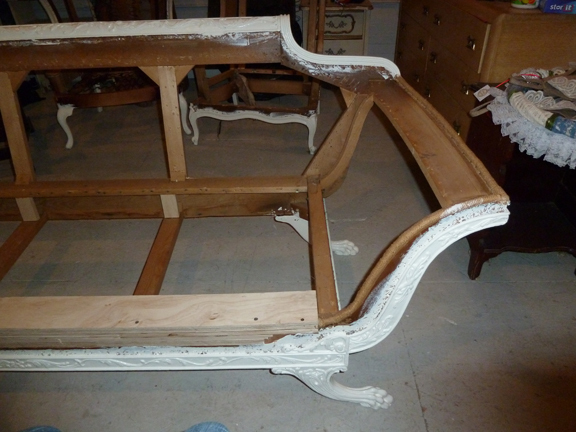 Check out one of Jeanne’s latest projects in our summer issue of Flea Market Decor, on stands now. 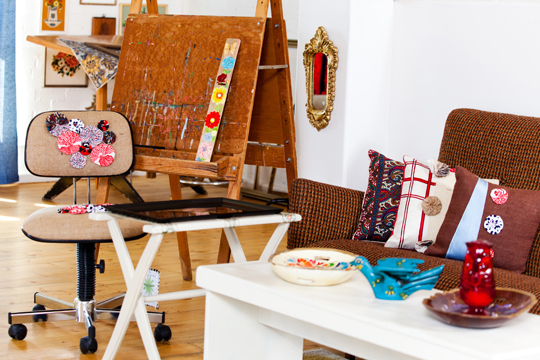 For more vintage and flea market design ideas from Jeanne Connolly, click here. This entry was posted in Repurpose It and tagged before & after, design ideas, hammers, Jeanne Connolly, miniature air gun, office chair, reupholster furniture, reupholstering tools, staple gun, staple removr, tacks, vintage, vintage design, vintage design ideas, vintage fabric, Vintage Renewal, wooden mallet by Flea Market Decor. Bookmark the permalink.